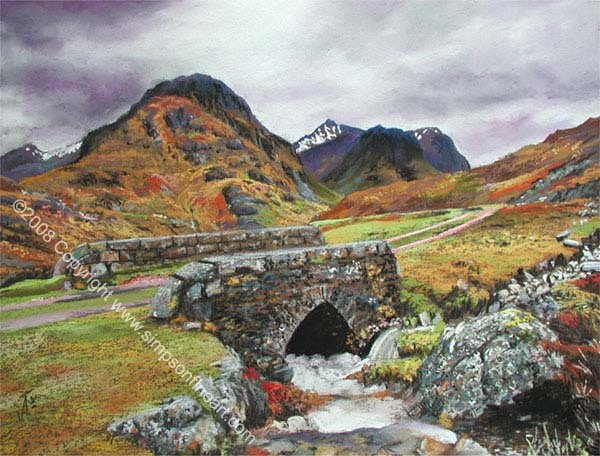 Original Landscape Paintings And Prints of Scotland By Scottish Artists Jamie Simpson and Jim Simpson. 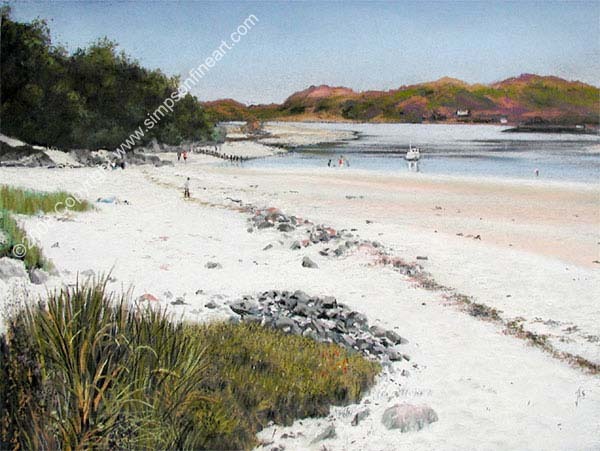 Choose from a huge range of Contemporary Scottish Art for sale and purchase directly from the Artists. 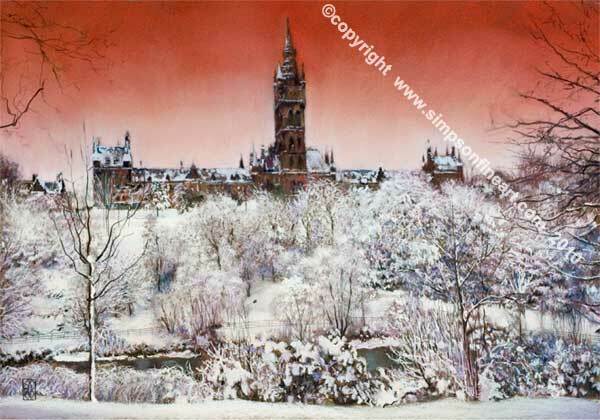 With Print galleries including Pictures of Glasgow and Edinburgh; from The Scottish Highlands and Islands; to Scotland's Castles and Lochs. 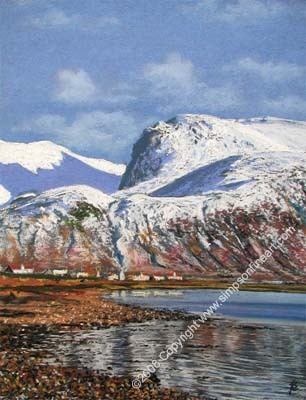 Artists Jim Simpson and Jamie Simpson have been painting Scotland Since 1999-and all of their Scottish landscape drawings and paintings are currently available as signed artist's prints many of which are limited edition prints from the Artists' extensive collection of Scottish Art Prints & Paintings. 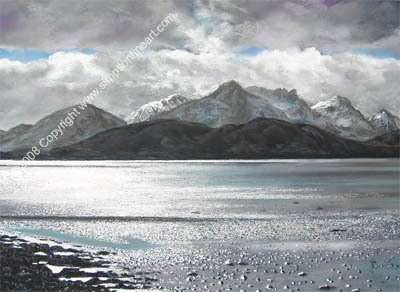 Browse the complete range of contemporary Scottish landscapes currently available to buy as limited edition and Signed Artist's Prints. 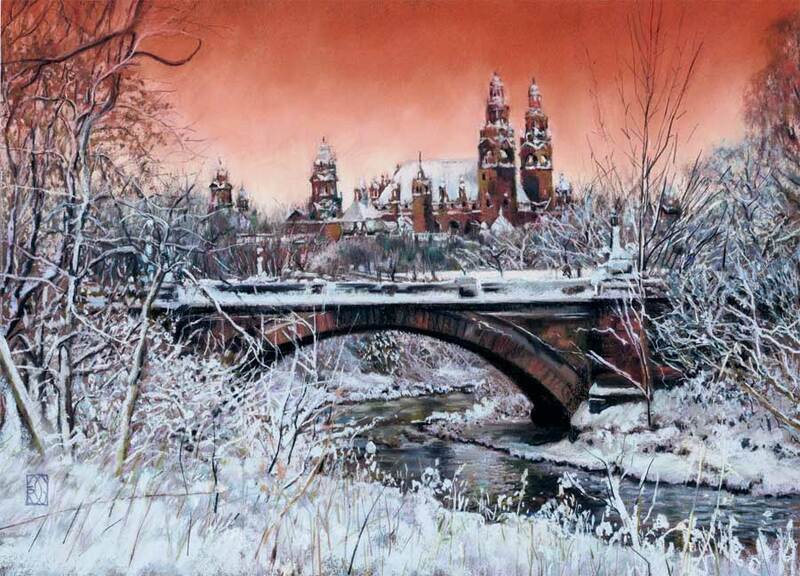 The Simpson Fine Art catalogue contains a huge variety of artwork, from the Artists' rural Scottish scenes through the wilds of the Highlands & Islands of Scotland to their vibrant sunsets & popular urban night scenes of Glasgow & Edinburgh. 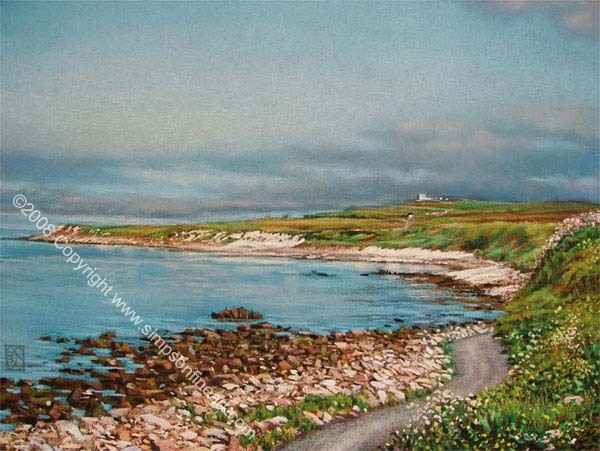 The original artworks are executed predominantly in soft artist's pastels but both Artists work in a variety of media including watercolours & oils. 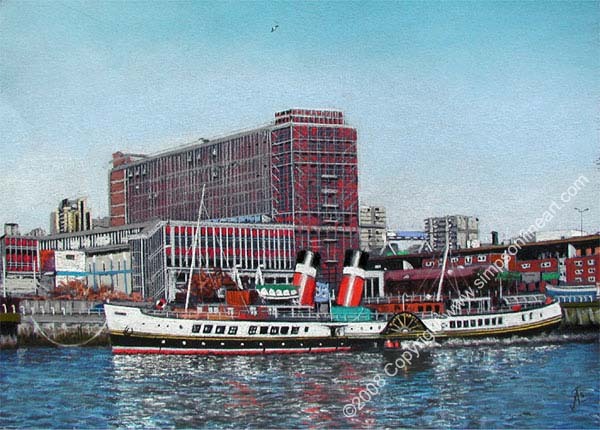 View the most popular prints from the artists' collection. 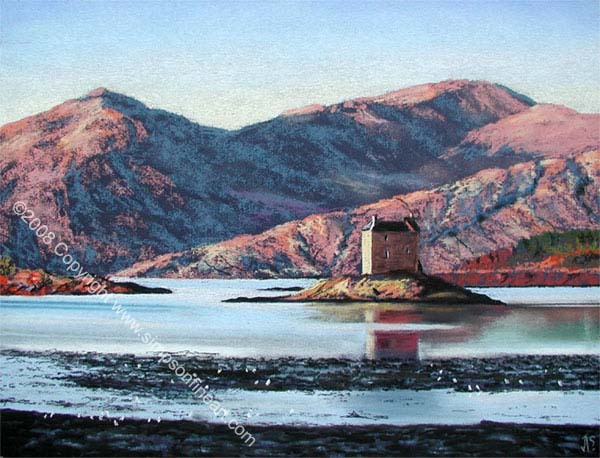 Including customers' favourites like Eilean Donan Castle; Oban and Iona. 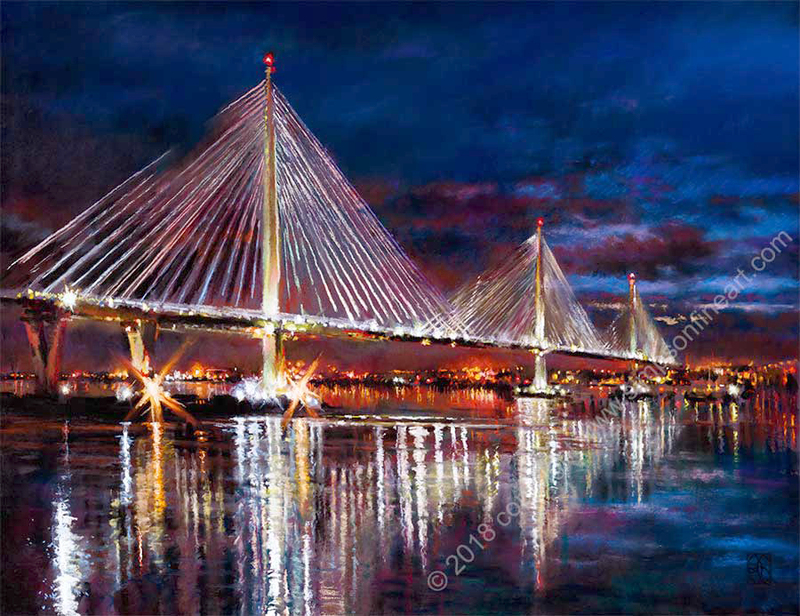 Featuring some of Scotland's best known views such as Glencoe; The Forth Bridge; Edinburgh Castle & Arthurs Seat and Scottish landmarks like Rosslyn Chapel; The Wallace Monument; and Dumbarton Rock the bestsellers gallery is the ideal place to find unique Scottish Gifts. 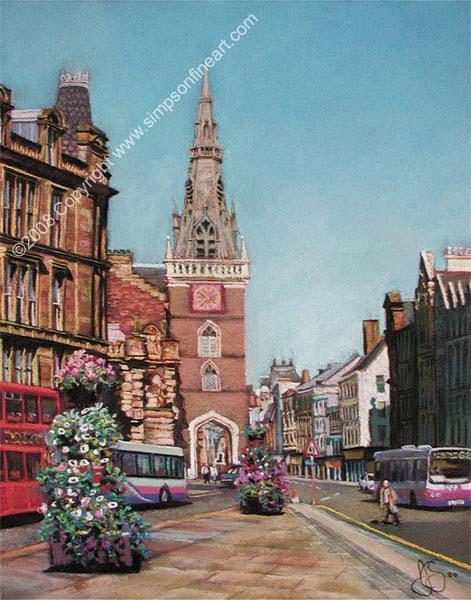 Of course, many of the best selling prints are local favourites too like Edinburgh Old Town; Ashton Lane; and Glasgow University featuring places which, for many customers hold a singular Scottish nostalgia like Millport or Rothesay. 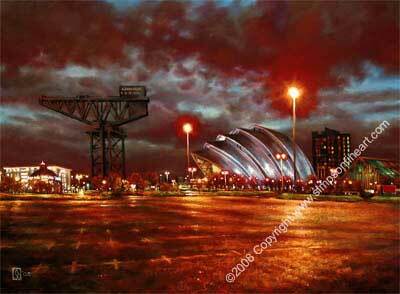 As Glasgow Based Artists some of Jim & Jamie Simpson's best loved work is from their home town including Glasgow Landmarks such as The Finnieston Crane; George Square & The City Chambers; Glasgow Cathedral and of course Glasgow University. Their well known street scenes of Glasgow by night capture many iconic Glasgow images; Buchanan Street By Night; The Four Spires from Charing Cross; The Barras Market; and The King's Theatre including many of Glasgow's most famous pubs and restaurants; Rogano; The Horseshoe Bar and Variety Bar. 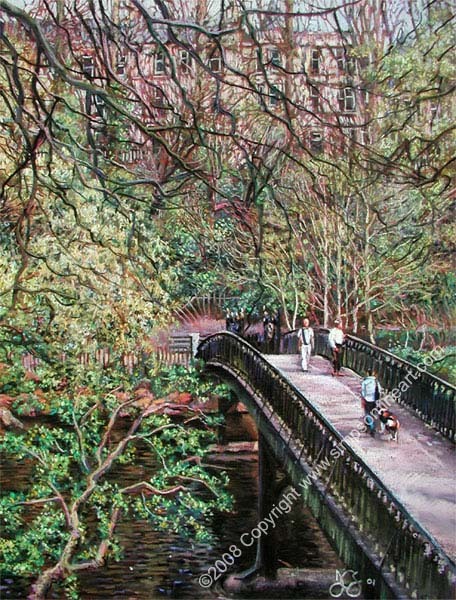 Having started out exhibiting in the West End of Glasgow , it is natural that it's distinctive atmosphere finds expression in their prints of The West End like; "A Midsummer Afternoon By The Kelvin"; "Ashton Lane, Glasgow By Night"; "University Cafe Glasgow By Night". 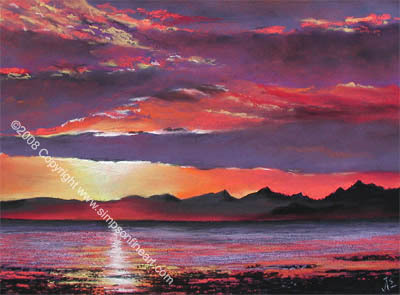 There is nothing quite as arresting as a Scottish sunset and the Sunrises & Sunsets Gallery contains some of the Artists' most popular prints; From the romance of the setting sun over the islands of Rhum & Eigg or the vibrant drama of Jim Simpson's Sunset over Arran to Jamie Simpson's sunrise over the historic town of Saint Andrews; this selection of their work includes their striking series of Winter Sunsets and views of Edinburgh and Glasgow under the magical spell of the setting sun. 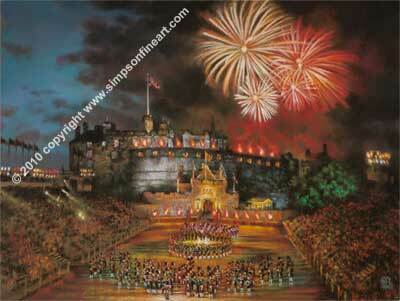 Scottish Art Prints & Paintings Edinburgh Prints Tattoo! 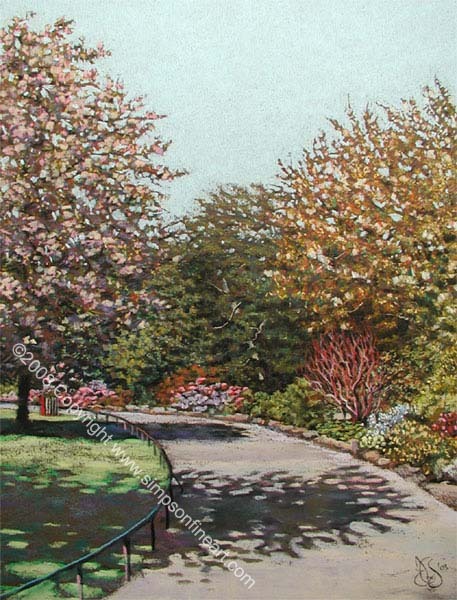 Knowing Edinburgh particularly well Jim & Jamie Simpson capture a real flavour of Scotland's capital city with Edinburgh street scenes from Leith to the Royal Mile, from Victoria Street & The Grassmarket to Arthurs Seat. 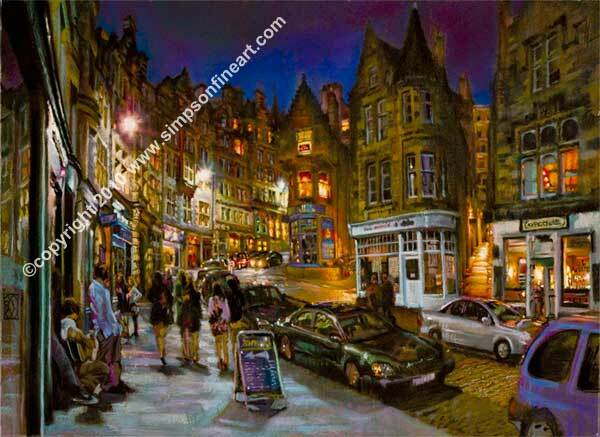 Evoking the city's distinctive atmosphere with intimate Edinburgh night scenes like Cockburn Street; Deacon Brodies Tavern and Rose Street, By Night it is no wonder that the artists' work is so popular with the locals. 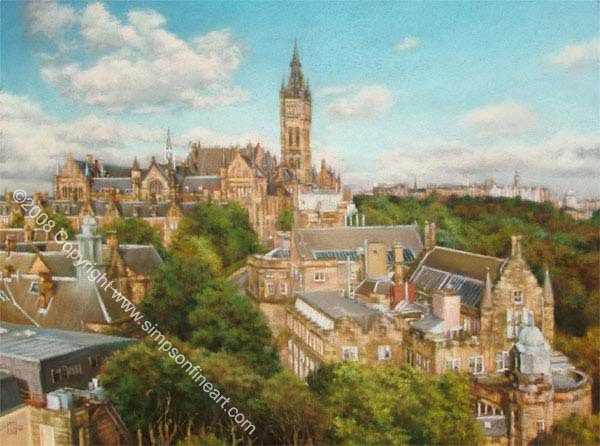 Having successfully exhibited during the Edinburgh Fringe Festival many of their Edinburgh prints like Greyfriars Bobby, Candlemaker Row or Edinburgh Castle are equally popular during tourist season as Scottish souvenirs although none are quite so popular as their spectacular prints of Edinburgh's Hogmanay Celebration and Edinburgh Military Tattoo. 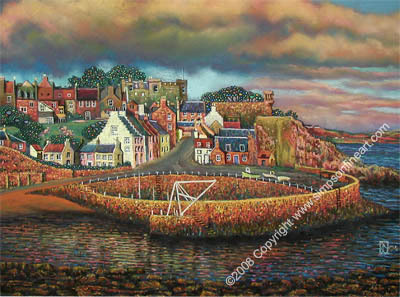 To Scottish Landscape Artists Scotland's castles are a constant reminder of the Scotland's history within that landscape. 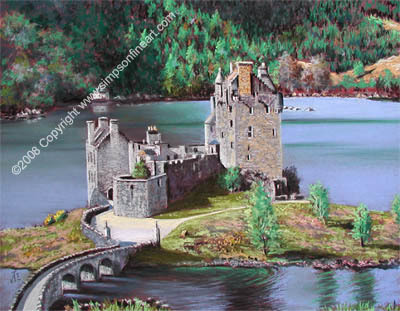 Jamie and Jim Simpson's prints of Scottish castles are for some a source of nostalgia, featuring venerable Scottish ruins like Kilchurn Castle and Urquhart Castle; or the romance of the remote Scottish castle standing in dramatic isolation like Castle Stalker or Dunvegan; for many they represent the ideal Scottish souvenir featuring famous Scottish Landmarks like Eilean Donnan; Edinburgh or Stirling Castle. 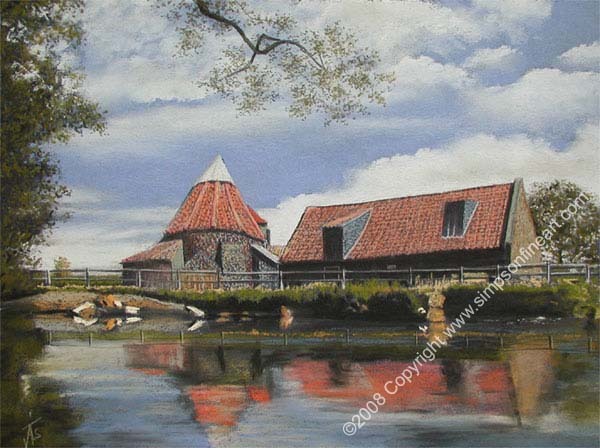 Featuring many of Scotland's stately homes like Culzean; Chatelherault or Pollok House many of the original paintings were commissioned for special occasions at Scottish wedding venues like Dundas; Comlongon or Linlithgow Palace. 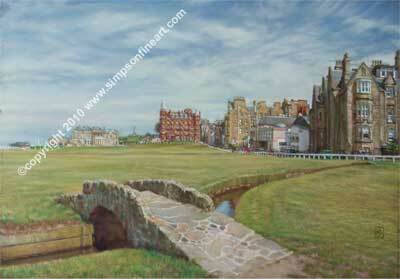 Golf Prints: from the home of golf, the Old Course, St Andrews to some of the most renowned Golf Courses in the world such as The Belfry; Muirfield and Loch Lomond the Golf Courses Gallery includes many of the most best known holes like the Golden Bell, Augusta or the Postage Stamp, Troon. 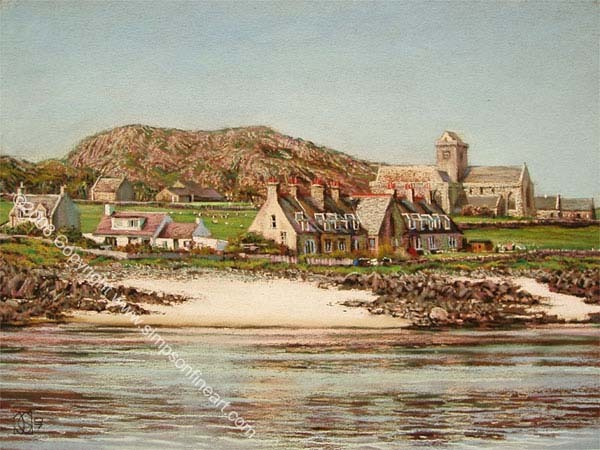 Often reproduced from the artists' commissioned work, the golf prints feature many local courses like Mount Ellen or Bothwell Castle through to famous views like the The 13th Hole at Gleneagles' King's Course, or The 15th Hole, Turnberry. 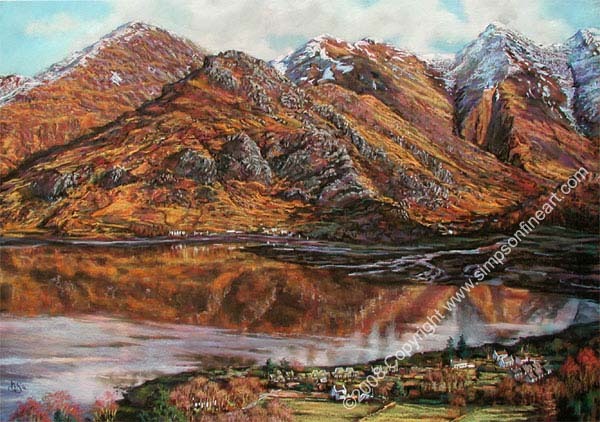 The Gallery of Scottish Highlands prints includes many of the artists' most Iconic Scottish Landscapes such as the majestic sweep of Glencoe; the grandeur of Scottish Mountains like the Five Sisters Of Kintail; Ben Nevis and The Buachaille, and the rugged beauty of the The West Highland Way. 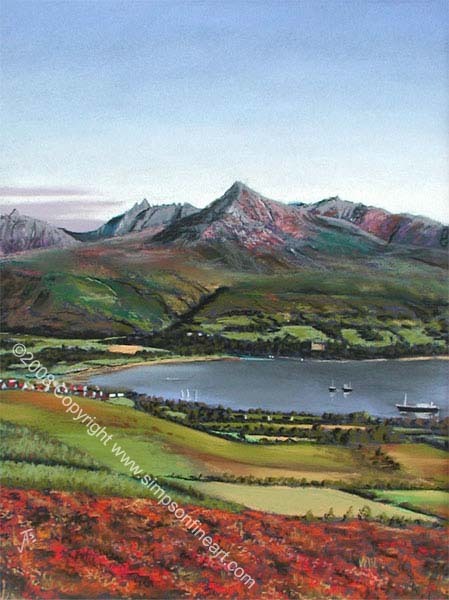 View Simpson Fine Art prints of famous Scottish Lochs and glens like Loch Ness or Loch Tummel & Schiehallion From Queen's View, from a blowy day on Skye to A Bright Sunny Day On Loch Lomond the artists capture the ever changing spirit of the Highlands. 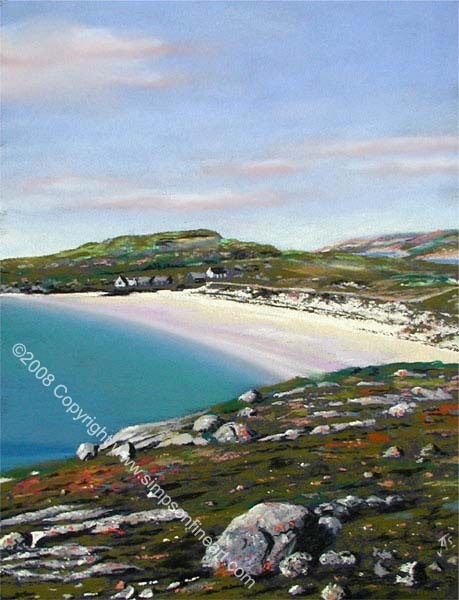 Containing some magnificent Scottish views like The Isle Of Barra or Goatfell, The isle of Arran the Scottish Islands Gallery includes prints of unspoilt Scottish Beaches from Jura and Gigha to those of The Western Isles like South Uist or The Isle of Harris. 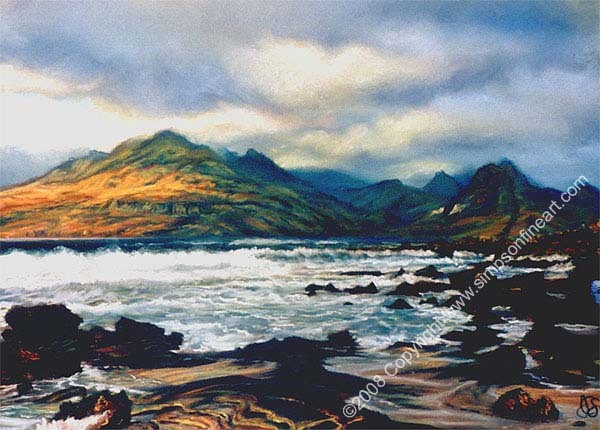 Featuring prints of the islands from the Gateway To the Isles to The Isle Of Skye; The Isle of Mull to The Isle Of Rhum and Arisaig and spectacular sunsets over Scotland's islands like Easdale and Iona, the artists capture much of the spirit of one of Scotland's most beautiful areas. 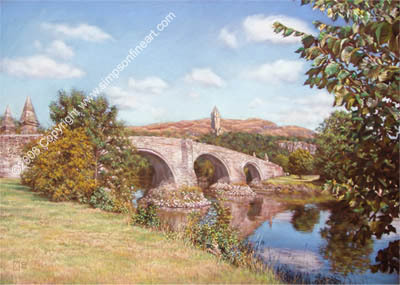 The Artists' interest in remarkable Scottish arcitechture is evident in the Churches and Monuments Gallery, celebrating Scottish Heritage in their prints of significant historical sites like The Wallace Monument; Glenfinnan; The Scott Monument; The Tolbooth, Glasgow or even little Greyfriars Bobby in Edinburgh. 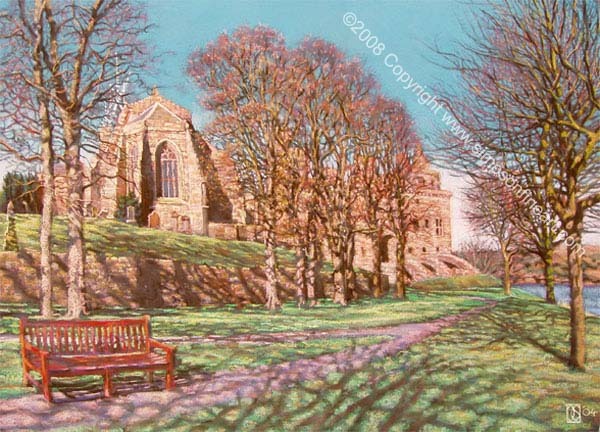 Scotland's legacy includes an enormous variety of Religious arcitechture much of which has provided inspiration for both artists; from soaring Scottish Cathedrals like Glasgow Cathedral or St Gile's in Edinburgh and many world renowned historic Scottish Buildings like Rosslyn Chapel; Iona Abbey or St Michael's Church & Linlithgow Palace to Local Churches from Coatbridge to Kirk O Shotts; from Paisley to Pitlochry and all over Scotland. 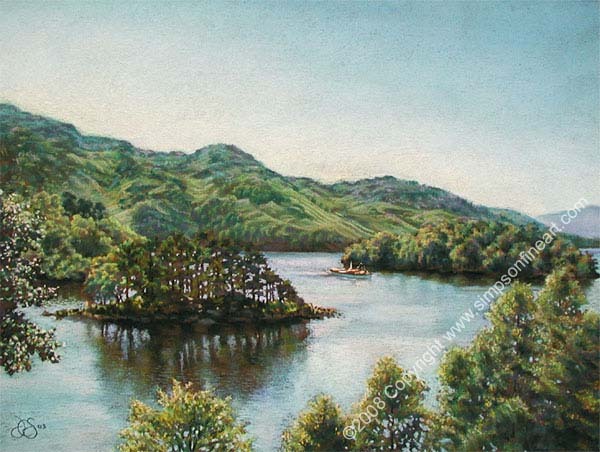 The Artists' Prints of Scottish Lochs include some of the world's most famous bodies of water like Loch Lomond and Loch Ness and feature many Scottish favourites too such as Loch Katrine or Loch Etive. 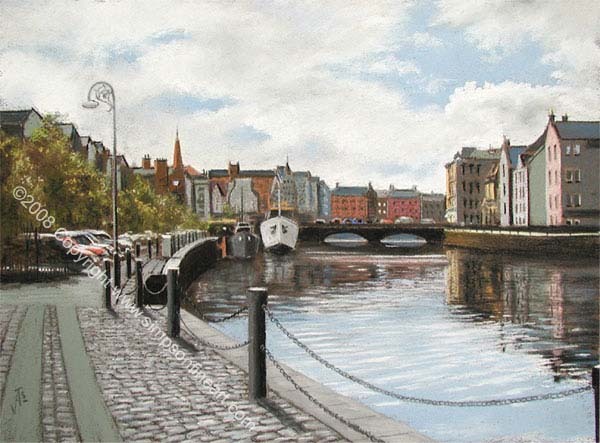 The Lochs & Rivers Gallery also contains some of the artists' own favourites like The River Kelvin and Kelvin Bridge, or The River Almond close to Livignston Designer Outlet where Jamie & Jim spent many years exhibiting and painting. 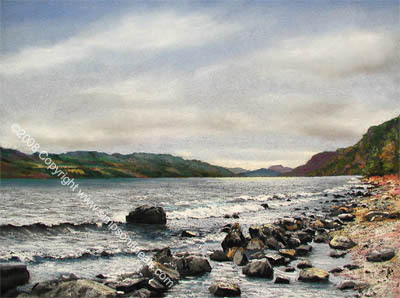 From world renowned views such as Loch Garry; Loch Awe and The Forth Bridge to their prints of Scottish Rivers featuring spectacular scenes of scottish waterfalls like The Falls Of Clyde; Falls Of Dochart and The Falls Of Falloch the artists' passion for Scottish Landscape Painting is always apparent. 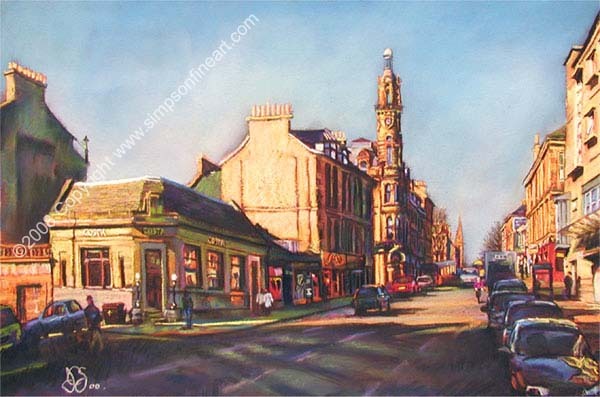 Jamie Simpson and Jim Simpson have painted many Scottish Hotels over the years and have a collection of hotel prints which ranges from world famous venues like Cameron House Hotel, Loch Lomond or One Devonshire Gardens, Glasgow to popular Scottish wedding venues like Houston House and Ross Priory. 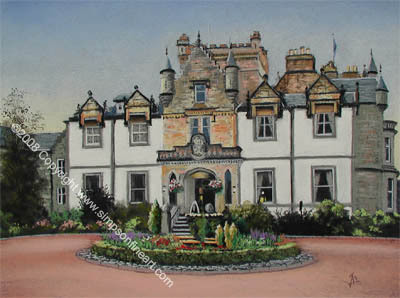 Many of the original paintings were commissioned to commemorate special occasions at local venues like The Popinjay Hotel or as far afield as The Old Schoolhouse, Vatersay, Isle Of Barra and many of the hotel buildings hold a special place in Scot's heritage like The Mill Hotel, New Lanark and Atholl Palace. 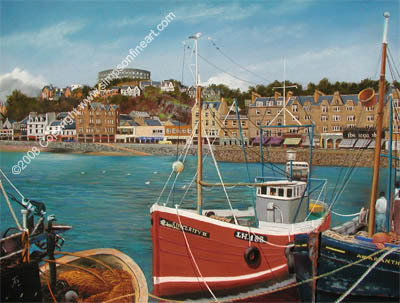 Some of Scotland's most striking views can be found where land meets the sea and the artists' prints of the Scottish coast celebrate the beauty of areas like The Kyles Of Bute and The White Sands Of Morar alongside the charm of Scottish Fishing Villages like those of the East Neuk of Fife such as Pittenweem or Anstruther. From Ardnamurchan to John O Groats; Portpatrick to Arbroath even spending a A Day On The Waverley there is a wide variety of Scotttish Coastal scenes to choose from. 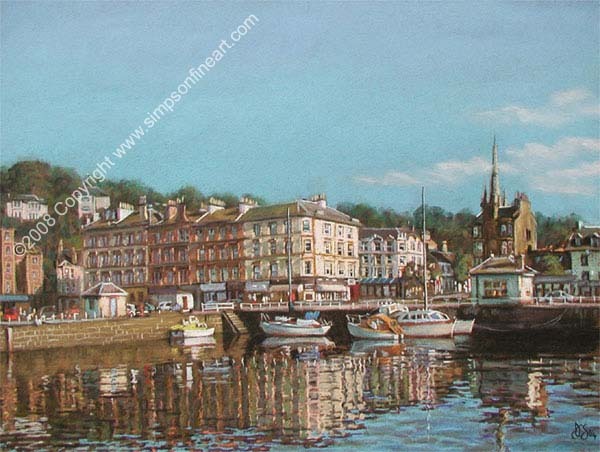 Jamie & Jim Simpson have painted many of Scotland's Towns and Villages including popular Scottish holiday destinations like Millport; North Berwick or Rothesay. 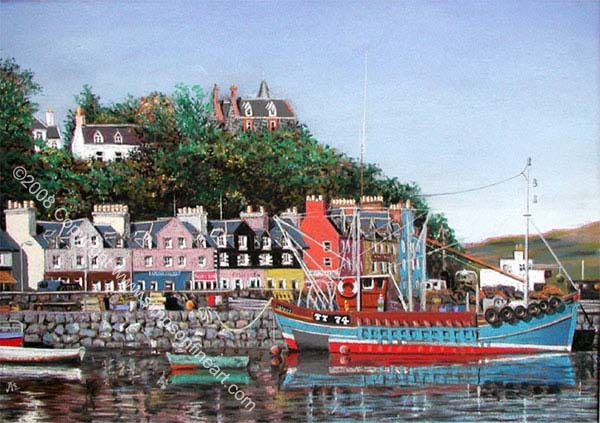 Deriving their insparation from the individual character of Towns & Villages from all over Scotland, from Blackwaterfoot on Arran and Tobermory on Mull to Saint Andrews and the distinctive Fishing villages of Fife such as St Monans and Crail . 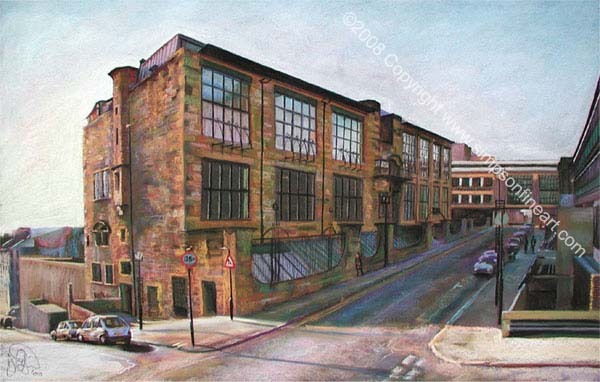 Often working in front of the public at exhibitions like their space at Mackinnon Mills the artists produced many paintings of the local area including Airdrie; Coatbridge; Bothwell and Bellshill and other local scenes, similarly they painted Dumbarton; Helensburgh and Alexandria when they exhibited there. 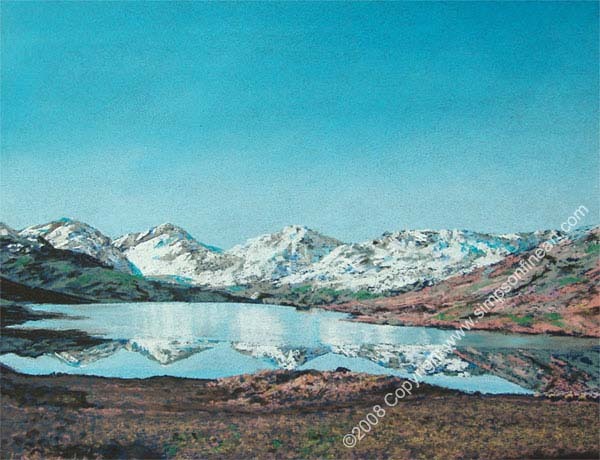 Simpson Fine Art offers a diverse range of Scottish Landscape Painting reproduced to the highest standards and checked for accuracy by the artists themselves. 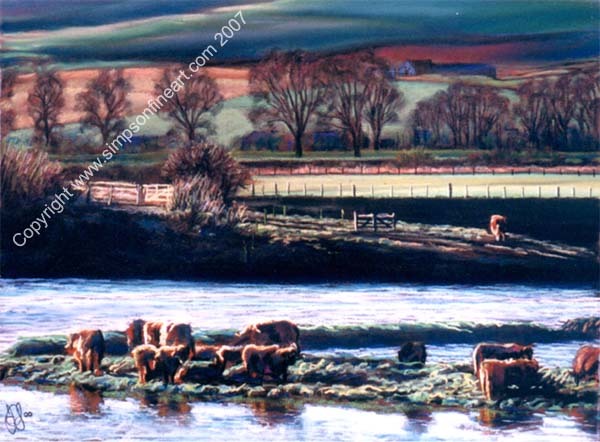 Our secure online shop contains over three hundred Scottish prints, many of which are Limited Editions and all Prints are signed by the artist. 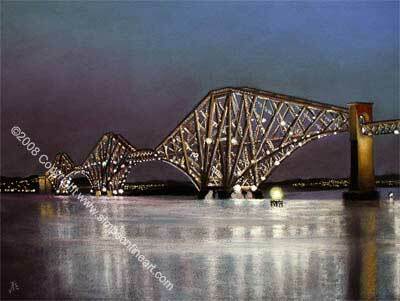 The prints come in two standard sizes: Large (27cm x 35cm Approx.) 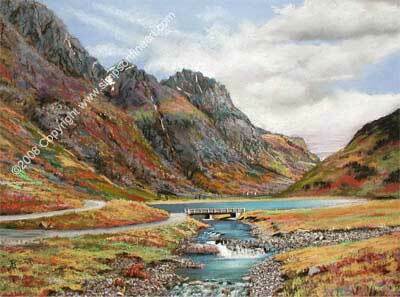 and Small (19.5cm x 27cm Approx) and are available as Unmounted Prints; Mounted Prints and Framed Prints. 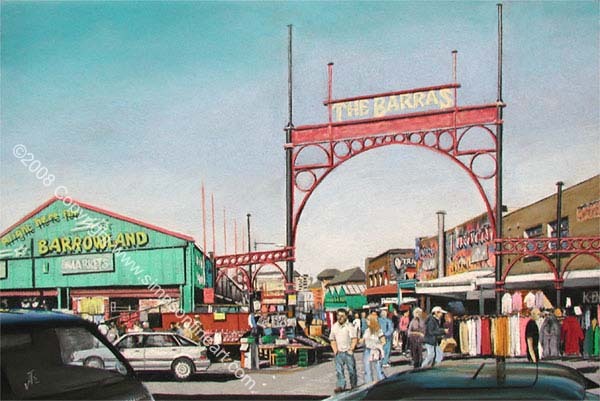 Many of our more recent prints are also available to order in Extra Large (A2 Size) or even larger- tailored to your requirements- look for these options on the product pages! Use our frame selection tool to preview your chosen prints in one of our range of frame styles. The choice of five frame mouldings which we offer are Beech, Black, Mahogany & Gold; Gold and Silver.